In tIreland in the 15th centuries two tower houses were built above the River Boyne, by the D’Exeter family. These tower houses became known as Carrick Castle. 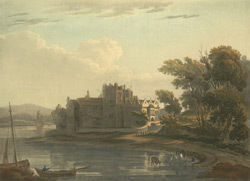 In the 17th century the towers were incorporated into a Manor House built by Thomas Butler, Tenth Earl of Ormonde, who because of his connections in England was one of the most powerful men in Ireland at the time. Throughout the 1560s Butler added to the house; he built a grange, added two wings and created a rectangular courtyard. The house was built using the most modern of building techniques and interior design, and images of Queen Elizabeth and her arms were displayed all around the house.